This article is about four-sided mathematical shapes. For other uses, see Quadrilateral (disambiguation). In Euclidean plane geometry, a quadrilateral is a polygon with four edges (or sides) and four vertices or corners. Sometimes, the term quadrangle is used, by analogy with triangle, and sometimes tetragon for consistency with pentagon (5-sided), hexagon (6-sided) and so on. The word "quadrilateral" is derived from the Latin words quadri, a variant of four, and latus, meaning "side". Any quadrilateral that is not self-intersecting is a simple quadrilateral. 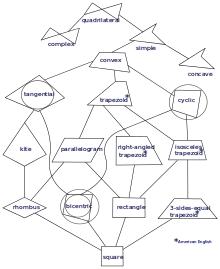 Euler diagram of some types of simple quadrilaterals. (UK) denotes British English and (US) denotes American English. In a convex quadrilateral, all interior angles are less than 180° and the two diagonals both lie inside the quadrilateral. Trapezium (UK) or trapezoid (US): at least one pair of opposite sides are parallel. Trapezia (UK) and trapezoids (US) include parallelograms. Isosceles trapezium (UK) or isosceles trapezoid (US): one pair of opposite sides are parallel and the base angles are equal in measure. Alternative definitions are a quadrilateral with an axis of symmetry bisecting one pair of opposite sides, or a trapezoid with diagonals of equal length. Parallelogram: a quadrilateral with two pairs of parallel sides. Equivalent conditions are that opposite sides are of equal length; that opposite angles are equal; or that the diagonals bisect each other. Parallelograms include rhombi (including those rectangles we call squares) and rhomboids (including those rectangles we call oblongs). In other words, parallelograms include all rhombi and all rhomboids, and thus also include all rectangles. Rhombus or rhomb: all four sides are of equal length. An equivalent condition is that the diagonals perpendicularly bisect each other. Informally: "a pushed-over square" (but strictly including a square, too). Rhomboid: a parallelogram in which adjacent sides are of unequal lengths and some angles are oblique (equivalently, having no right angles). Informally: "a pushed-over oblong". Not all references agree, some define a rhomboid as a parallelogram which is not a rhombus. Rectangle: all four angles are right angles. An equivalent condition is that the diagonals bisect each other and are equal in length. Rectangles include squares and oblongs. Informally: "a box or oblong" (including a square). Square (regular quadrilateral): all four sides are of equal length (equilateral), and all four angles are right angles. An equivalent condition is that opposite sides are parallel (a square is a parallelogram), that the diagonals perpendicularly bisect each other, and are of equal length. A quadrilateral is a square if and only if it is both a rhombus and a rectangle (four equal sides and four equal angles). Oblong: a term sometimes used to denote a rectangle which has unequal adjacent sides (i.e. a rectangle that is not a square). Kite: two pairs of adjacent sides are of equal length. This implies that one diagonal divides the kite into congruent triangles, and so the angles between the two pairs of equal sides are equal in measure. It also implies that the diagonals are perpendicular. Kites include rhombi. Tangential quadrilateral: the four sides are tangents to an inscribed circle. A convex quadrilateral is tangential if and only if opposite sides have equal sums. Tangential trapezoid: a trapezoid where the four sides are tangents to an inscribed circle. Cyclic quadrilateral: the four vertices lie on a circumscribed circle. A convex quadrilateral is cyclic if and only if opposite angles sum to 180°. Right kite: a kite with two opposite right angles. It is a type of cyclic quadrilateral. Bicentric quadrilateral: it is both tangential and cyclic. Orthodiagonal quadrilateral: the diagonals cross at right angles. Equidiagonal quadrilateral: the diagonals are of equal length. Ex-tangential quadrilateral: the four extensions of the sides are tangent to an excircle. An equilic quadrilateral has two opposite equal sides that, when extended, meet at 60°. A Watt quadrilateral is a quadrilateral with a pair of opposite sides of equal length. A quadric quadrilateral is a convex quadrilateral whose four vertices all lie on the perimeter of a square. A diametric quadrilateral is a cyclic quadrilateral having one of its sides as a diameter of the circumcircle. A Hjelmslev quadrilateral is a quadrilateral with two right angles at opposite vertices. In a concave quadrilateral, one interior angle is bigger than 180° and one of the two diagonals lies outside the quadrilateral. A dart (or arrowhead) is a concave quadrilateral with bilateral symmetry like a kite, but one interior angle is reflex. See (concave) kite. A self-intersecting quadrilateral is called variously a cross-quadrilateral, crossed quadrilateral, butterfly quadrilateral or bow-tie quadrilateral. In a crossed quadrilateral, the four "interior" angles on either side of the crossing (two acute and two reflex, all on the left or all on the right as the figure is traced out) add up to 720°. Antiparallelogram: a crossed quadrilaterals in which (like a parallelogram) each pair of nonadjacent sides have equal lengths. Crossed rectangle: an antiparallelogram whose sides are two opposite sides and the two diagonals of a rectangle, hence having one pair of opposite sides parallel. Crossed square: a special case of a crossed rectangle where two of the sides intersect at right angles. The two diagonals of a convex quadrilateral are the line segments that connect opposite vertices. The two bimedians of a convex quadrilateral are the line segments that connect the midpoints of opposite sides. They intersect at the "vertex centroid" of the quadrilateral (see Remarkable points below). The four maltitudes of a convex quadrilateral are the perpendiculars to a side through the midpoint of the opposite side. There are various general formulas for the area K of a convex quadrilateral ABCD with sides a = AB, b = BC, c = CD and d = DA. where the lengths of the bimedians are m and n and the angle between them is φ.
where the sides in sequence are a, b, c, d, where s is the semiperimeter, and A and C are two (in fact, any two) opposite angles. This reduces to Brahmagupta's formula for the area of a cyclic quadrilateral when A + C = 180°. where x is the distance between the midpoints of the diagonals and φ is the angle between the bimedians. which can also be used for the area of a concave quadrilateral (having the concave part opposite to angle α) just changing the first sign + to - . The first reduces to Brahmagupta's formula in the cyclic quadrilateral case, since then pq = ac + bd. if the lengths of two diagonals and one bimedian are given. In the following table it is listed if the diagonals in some of the most basic quadrilaterals bisect each other, if their diagonals are perpendicular, and if their diagonals have equal length. The list applies to the most general cases, and excludes named subsets. Note 1: The most general trapezoids and isosceles trapezoids do not have perpendicular diagonals, but there are infinite numbers of (non-similar) trapezoids and isosceles trapezoids that do have perpendicular diagonals and are not any other named quadrilateral. Note 2: In a kite, one diagonal bisects the other. The most general kite has unequal diagonals, but there is an infinite number of (non-similar) kites in which the diagonals are equal in length (and the kites are not any other named quadrilateral). where x is the distance between the midpoints of the diagonals. :p.126 This is sometimes known as Euler's quadrilateral theorem and is a generalization of the parallelogram law. This relation can be considered to be a law of cosines for a quadrilateral. In a cyclic quadrilateral, where A + C = 180°, it reduces to pq = ac + bd. Since cos (A + C) ≥ −1, it also gives a proof of Ptolemy's inequality. where e = AE, f = BE, g = CE, and h = DE. The internal angle bisectors of a convex quadrilateral either form a cyclic quadrilateral:p.127 (that is, the four intersection points of adjacent angle bisectors are concyclic) or they are concurrent. In the latter case the quadrilateral is a tangential quadrilateral. In quadrilateral ABCD, if the angle bisectors of A and C meet on diagonal BD, then the angle bisectors of B and D meet on diagonal AC. The bimedians of a quadrilateral are the line segments connecting the midpoints of the opposite sides. The intersection of the bimedians is the centroid of the vertices of the quadrilateral. Each pair of opposite sides of the Varignon parallelogram are parallel to a diagonal in the original quadrilateral. A side of the Varignon parallelogram is half as long as the diagonal in the original quadrilateral it is parallel to. The area of the Varignon parallelogram equals half the area of the original quadrilateral. This is true in convex, concave and crossed quadrilaterals provided the area of the latter is defined to be the difference of the areas of the two triangles it is composed of. The perimeter of the Varignon parallelogram equals the sum of the diagonals of the original quadrilateral. The diagonals of the Varignon parallelogram are the bimedians of the original quadrilateral. This is also a corollary to the parallelogram law applied in the Varignon parallelogram. Note that the two opposite sides in these formulas are not the two that the bimedian connects. The two bimedians have equal length if and only if the two diagonals are perpendicular. The two bimedians are perpendicular if and only if the two diagonals have equal length. In the last two formulas, no angle is allowed to be a right angle, since tan 90° is not defined. with equality only for a rectangle. with equality only for a square. with equality only if the diagonals are perpendicular and equal. with equality if and only if the quadrilateral is cyclic or degenerate such that one side is equal to the sum of the other three (it has collapsed into a line segment, so the area is zero). with equality only in the case of a square. for diagonal lengths p and q, with equality if and only if the diagonals are perpendicular. where equality holds if and only if the quadrilateral is a parallelogram. where there is equality if and only if the quadrilateral is cyclic. :p.128–129 This is often called Ptolemy's inequality. where K is the area of a convex quadrilateral with perimeter L. Equality holds if and only if the quadrilateral is a square. The dual theorem states that of all quadrilaterals with a given area, the square has the shortest perimeter. The quadrilateral with given side lengths that has the maximum area is the cyclic quadrilateral. where θ is the angle between the diagonals p and q. Equality holds if and only if θ = 90°. 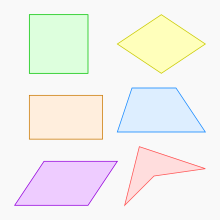 The centre of a quadrilateral can be defined in several different ways. The "vertex centroid" comes from considering the quadrilateral as being empty but having equal masses at its vertices. The "side centroid" comes from considering the sides to have constant mass per unit length. The usual centre, called just centroid (centre of area) comes from considering the surface of the quadrilateral as having constant density. These three points are in general not all the same point. The "vertex centroid" is the intersection of the two bimedians. As with any polygon, the x and y coordinates of the vertex centroid are the arithmetic means of the x and y coordinates of the vertices. The "area centroid" of quadrilateral ABCD can be constructed in the following way. Let Ga, Gb, Gc, Gd be the centroids of triangles BCD, ACD, ABD, ABC respectively. Then the "area centroid" is the intersection of the lines GaGc and GbGd. In a general convex quadrilateral ABCD, there are no natural analogies to the circumcenter and orthocenter of a triangle. But two such points can be constructed in the following way. Let Oa, Ob, Oc, Od be the circumcenters of triangles BCD, ACD, ABD, ABC respectively; and denote by Ha, Hb, Hc, Hd the orthocenters in the same triangles. 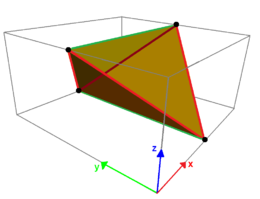 Then the intersection of the lines OaOc and ObOd is called the quasicircumcenter, and the intersection of the lines HaHc and HbHd is called the quasiorthocenter of the convex quadrilateral. These points can be used to define an Euler line of a quadrilateral. In a convex quadrilateral, the quasiorthocenter H, the "area centroid" G, and the quasicircumcenter O are collinear in this order, and HG = 2GO. There can also be defined a quasinine-point center E as the intersection of the lines EaEc and EbEd, where Ea, Eb, Ec, Ed are the nine-point centers of triangles BCD, ACD, ABD, ABC respectively. Then E is the midpoint of OH. Another remarkable line in a convex non-parallelogram quadrilateral is the Newton line, which connects the midpoints of the diagonals, the segment connecting these points being bisected by the vertex centroid. One more interesting line (in some sense dual to the Newton's one) is the line connecting the point of intersection of diagonals with the vertex centroid. The line is remarkable by the fact that it contains the (area) centroid. 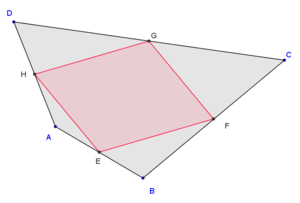 The vertex centroid divides the segment connecting the intersection of diagonals and the (area) centroid in the ratio 3:1. For any quadrilateral ABCD with points P and Q the intersections of AD and BC and AB and CD, respectively, the circles (PAB), (PCD), (QAD), and (QBC) pass through a common point M, called a Miquel point. Let exterior squares be drawn on all sides of a quadrilateral. The segments connecting the centers of opposite squares are (a) equal in length, and (b) perpendicular. Thus these centers are the vertices of an orthodiagonal quadrilateral. This is called Van Aubel's theorem. For any simple quadrilateral with given edge lengths, there is a cyclic quadrilateral with the same edge lengths. The four smaller triangles formed by the diagonals and sides of a convex quadrilateral have the property that the product of the areas of two opposite triangles equals the product of the areas of the other two triangles. 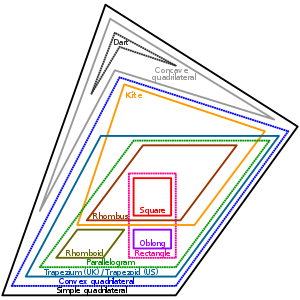 A hierarchical taxonomy of quadrilaterals is illustrated by the figure to the right. Lower classes are special cases of higher classes they are connected to. Note that "trapezoid" here is referring to the North American definition (the British equivalent is a trapezium). Inclusive definitions are used throughout. A non-planar quadrilateral is called a skew quadrilateral. Formulas to compute its dihedral angles from the edge lengths and the angle between two adjacent edges were derived for work on the properties of molecules such as cyclobutane that contain a "puckered" ring of four atoms. Historically the term gauche quadrilateral was also used to mean a skew quadrilateral. A skew quadrilateral together with its diagonals form a (possibly non-regular) tetrahedron, and conversely every skew quadrilateral comes from a tetrahedron where a pair of opposite edges is removed. ^ Keady, G.; Scales, P.; Németh, S. Z. (2004). "Watt Linkages and Quadrilaterals". The Mathematical Gazette. 88 (513): 475–492. ^ Jobbings, A. K. (1997). "Quadric Quadrilaterals". The Mathematical Gazette. 81 (491): 220–224. ^ Beauregard, R. A. (2009). "Diametric Quadrilaterals with Two Equal Sides". College Mathematics Journal. 40 (1): 17–21. ^ Hartshorne, R. (2005). Geometry: Euclid and Beyond. Springer. pp. 429–430. ISBN 978-1-4419-3145-0. ^ Butler, David (2016-04-06). "The crossed trapezium". Making Your Own Sense. Retrieved 2017-09-13. ^ E.W. Weisstein. "Bimedian". 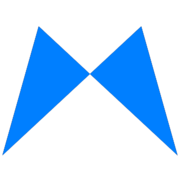 MathWorld – A Wolfram Web Resource. ^ E.W. Weisstein. "Maltitude". MathWorld – A Wolfram Web Resource. ^ a b c Josefsson, Martin (2013), "Five Proofs of an Area Characterization of Rectangles" (PDF), Forum Geometricorum, 13: 17–21 . ^ Mitchell, Douglas W., "The area of a quadrilateral," Mathematical Gazette 93, July 2009, 306–309. ^ J. L. Coolidge, "A historically interesting formula for the area of a quadrilateral", American Mathematical Monthly, 46 (1939) 345–347. ^ E.W. Weisstein. "Bretschneider's formula". MathWorld – A Wolfram Web Resource. ^ Archibald, R. C., "The Area of a Quadrilateral", American Mathematical Monthly, 29 (1922) pp. 29–36. ^ a b Josefsson, Martin (2011), "The Area of a Bicentric Quadrilateral" (PDF), Forum Geometricorum, 11: 155–164 . ^ a b c d e f Altshiller-Court, Nathan, College Geometry, Dover Publ., 2007. ^ a b Josefsson, Martin (2016) ‘100.31 Heron-like formulas for quadrilaterals’, The Mathematical Gazette, 100 (549), pp. 505–508. ^ Kahle, Jennifer, Geometry: Basic ideas, , accessed 28 December 2012. ^ Rashid, M. A. & Ajibade, A. O., "Two conditions for a quadrilateral to be cyclic expressed in terms of the lengths of its sides", Int. J. Math. Educ. Sci. Technol., vol. 34 (2003) no. 5, pp. 739–799. ^ Andreescu, Titu & Andrica, Dorian, Complex Numbers from A to...Z, Birkhäuser, 2006, pp. 207–209. ^ a b Josefsson, Martin (2012), "Characterizations of Orthodiagonal Quadrilaterals" (PDF), Forum Geometricorum, 12: 13–25 . ^ Hoehn, Larry (2011), "A New Formula Concerning the Diagonals and Sides of a Quadrilateral" (PDF), Forum Geometricorum, 11: 211–212 . ^ E.W. Weisstein. "Quadrilateral". MathWorld - A Wolfram Web Resource. ^ Leversha, Gerry, "A property of the diagonals of a cyclic quadrilateral", Mathematical Gazette 93, March 2009, 116–118. ^ H. S. M. Coxeter and S. L. Greitzer, Geometry Revisited, MAA, 1967, pp. 52–53. ^ C. V. Durell & A. Robson, Advanced Trigonometry, Dover, 2003, p. 267. ^ O. Bottema, Geometric Inequalities, Wolters–Noordhoff Publishing, The Netherlands, 1969, pp. 129, 132. ^ a b c d Alsina, Claudi; Nelsen, Roger (2009), When Less is More: Visualizing Basic Inequalities, Mathematical Association of America, p. 68 . ^ Josefsson, Martin (2014). "Properties of equidiagonal quadrilaterals". Forum Geometricorum. 14: 129–144. ^ a b Inequalities proposed in “Crux Mathematicorum”, . ^ a b Peter, Thomas, "Maximizing the Area of a Quadrilateral", The College Mathematics Journal, Vol. 34, No. 4 (September 2003), pp. 315–316. ^ Alsina, Claudi; Nelsen, Roger (2010). Charming Proofs : A Journey Into Elegant Mathematics. Mathematical Association of America. pp. 114, 119, 120, 261. ISBN 978-0-88385-348-1. ^ King, James, Two Centers of Mass of a Quadrilateral, , Accessed 2012-04-15. ^ Honsberger, Ross, Episodes in Nineteenth and Twentieth Century Euclidean Geometry, Math. Assoc. Amer., 1995, pp. 35–41. ^ a b c d Myakishev, Alexei (2006), "On Two Remarkable Lines Related to a Quadrilateral" (PDF), Forum Geometricorum, 6: 289–295 . ^ Chen, Evan (2016). Euclidean Geometry in Mathematical Olympiads. Washington, D.C.: Mathematical Association of America. p. 198. ISBN 9780883858394. ^ Josefsson, Martin, "Characterizations of Trapezoids", Forum Geometricorum 13 (2013) 23–35. ^ Barnett, M. P.; Capitani, J. F. (2006). "Modular chemical geometry and symbolic calculation". International Journal of Quantum Chemistry. 106 (1): 215–227. doi:10.1002/qua.20807. ^ Hamilton, William Rowan (1850). "On Some Results Obtained by the Quaternion Analysis Respecting the Inscription of "Gauche" Polygons in Surfaces of the Second Order" (PDF). Proceedings of the Royal Irish Academy. 4: 380–387. Wikimedia Commons has media related to Tetragons. Weisstein, Eric W. "Quadrilateral". MathWorld. Quadrilateral Venn Diagram Quadrilaterals expressed in the form of a Venn diagram, where the areas are also the shape of the quadrilateral they describe.